When I came across this questions, I fully expect the answer to be something rather straightforward, and to learn a neat new party fact that applied to pipe hangers and supports, but it's a bit more complicated than that. I'm impressed with how confusing we can make the concept of long cylinders. Tubing is used mainly for structural applications. Tubing does not have to be cylindrical and comes as a square, rectangles, and even other custom shapes. Now depending on the application, the material can follow standards set by several different standard organizations including the International Organization for Standardization (ISO) and ASTM International (ASTM) around the globe. Pipe, on the other hand, is generally used for the transmission of fluids or gases. Transmission of material is the application we see on a daily basis as we deal with pipe clamps and pipe supports and is the standard usage of pipe. Most pipe follows generally accepted standards like American Society of Mechanical Engineers (ASME) standards B36.10M and B36.19M, which provides reference tables concerning the different manufacturing parameters to which the pipe needs to adhere. One final note on piping, when considering the purpose of your piping system, you will need to think through what material made the pipe. The metal selected is critical because most engineering standards will dictate that your pipe supports be the same material as your pipe; for example, on a copper pipe, you will want to use copper pipe hangers to prevent the impacts of dissimilar metals coming into contact with each other. These dimensions organize tubing into the different requirements and just like pipe you will see there are standard versions. Something interesting is that tube size charts leverage two new acronyms to me BWG and SWG. BWG is Birmingham Wire Guage, and SWG is Standard Wire Guage (the less popular of the two), which are essentially scales that represent a tubes thickness and can convert to mm or inches. When you look at the organized structure to how tubing is divided, pipe looks like a hodgepodge of naming conventions. Piping is specified by Nominal Pipe Size (NPS) and Schedule (wall thickness). NPS refers to pipe sizes in non-specific terms and 3" pipe is not exactly 3" in OD like you would find with tubing. The process of formalizing pipe sizing dates back to the early 20th century but has gone through many revisions based on American Petroleum Institute (API), ASTM, American National Standards Institute (ANSI), and other organizations. Thankfully, it's as easy as going to Wikipedia to find a clear outline of the standards for NPS and what they correlate to for OD and various wall thicknesses. As a fun fact DN is an international designation based on ISO 6708 for NPS and stands for nominal diameter. Hoses continue to live in their world, but fortunately, make life a bit simpler by using terms we've seen before. Unlike tubes, which use the OD to determine the size, hoses use the ID to determine size. The use of the interior diameter stems from a focus on hose flow rates, so identifying the ID, OD, and length of the hose impacts the flow rate through the hose. Hoses leverage something called a dash system. This dash size is a reference to the diameter of the hose in 1/16" increments, but like any industry there is nuance. For more information, I recommend checking out the excellent content that some tube manufacturers put out like Parker. When it comes to manufacturing, tubes have a much more strict process because of tighter tolerances on diameter, wall thickness, straightness, and roundness of the cylinder. These tighter tolerances requirements lead to a higher degree of testing and inspection of tubing compared to piping products. The testing can be seen even down to the raw material used in the production process. Moreover, to wrap things up, hoses are a completely different material compared to tube and pipe, and so the process looks very different when you are manufacturing a rubber or PTFE part compared to carbon steel or stainless steel. Fortunately for all of us, there are a ton of cool videos on YouTube, and I highly recommend cruising over there. 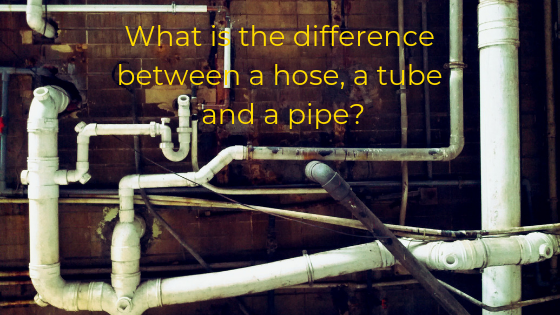 I hope this sheds some light on the differences of hoses, pipes, and tubes. I never imagined that tubes would be much more complicated, intricate, and interesting than what I had previously thought, but you learn something new every day. Reach out to our team if you have any issues with riser clamps, clevis hangers, or anything else you use to support your tubing or piping systems.